By Jacqui	| Published on Thursday, June 2, 2011. 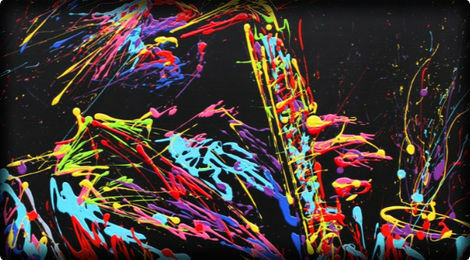 Arnaud Florentin, aka Flow Painting, is an artist from Nancy that developed a technique based on splattering paint and color. Interview and images. This article on Flow Painting was originally posted in French in May 2010, and translated for our English audience by our Editorial Assistant Jacqui. Interview with Arnaud Florentin, known as Flow Painting, a talented painter from Nancy. FC: How did you start painting and where did this desire to create come from? I started drawing in elementary school but I became seriously interested in art in high school. I drew and I painted on any surface I could get my hands on: cardboard, wood planks, sheets…I also sculpted clay and wood. Later I took up graffiti, painting big frescoes in warehouses and vacant lots. In 1998, I entered the Fine Arts School of Paris (l'école des Beaux Arts) with a collection of portraits. Since then I’ve been continuing my work. FC: Where does this attraction to color and splattering paint come from? Color and projection quickly became a part of my work from the beginning. When I first started many years ago, I painted big, dripping faces in black and white. The movement, speed and energy of my figures manifest in this manner. Body movement is very important in my painting. Painting should live, overwhelm, flow, express. FC: Are you involved with graffiti or street art? Yes, I did graffiti for a bit while I was also painting on canvas. This lasted for a few years, from high school to my first years of art school. I mixed acrylic and aerosol paint on walls. I was interested in the confrontation on a large scale and the color palette of graffiti. FC: Do you still do work like that or is that a part of your past now? Yes, I'll do big outdoor pieces from time to time for a change in material and size. FC: Do you use a picture when you do portraits or do you start from scratch? I usually start with a model in a shooting or with pictures taken in the street. Photography is a part of my work and I also sketch. The mix of drawings and photos give me the idea for the canvas. FC: I imagine that you were influenced by Pollock. What are your other influences? Yes, he pioneered the Dripping technique. However, this technique is imposed by itself. It’s a step in the process of creation. By casting the paint in broad brush strokes, I chose to not touch the canvas. The painter's entire movement is what directs the paint to where it will dry. So my painting is split in two: on one side the Dripping technique that I have been experimenting with for four years and on the other the paintbrush work I have developed for ten years. I was influenced by painters like Lucian Freud, Francis Bacon, Jenny Saville and also De Kooning and Soulages...There are many people that inspire me! FC: You’re from Nancy. Is it harder to become known when you’re not from Paris? Do you feel like you have to go through Paris to be successful? I don’t think that it’s harder to become known, but it may take longer. I work with galleries in Strasbourg, Metz and Nancy and do exhibitions in France, Belgium, Luxembourg and even Korea. Paris inspires me with its energy, effervescence and numerous exhibitions. I visit regularly but it’s much easier to live and find a studio in Province! Besides that, I showed a large series of portraits at Shop, a place for Street Art in the 1st district of Paris, during the time when they exhibited artists. Last year I worked with a gallery in the 18th district. Kadour is from Nancy like me. He knows my work and I know his killer dunks! He has a great strength about him, an ease with defying the laws of gravity when he slam dunks...It’s what I look for in painting. FC: What are your next plans? Exhibitions? Another collection? Travelling? Collaborations? I was a part of an exhibition in Cannes of twenty or so pieces from May to September at the GDG Daniel Guidat gallery. I’m working on a new collection in collaboration with other artists. Publishing projects and exhibitions in salons and galleries are all coming up...I also particpated in a project called PERFFUSION in Lyon in May.